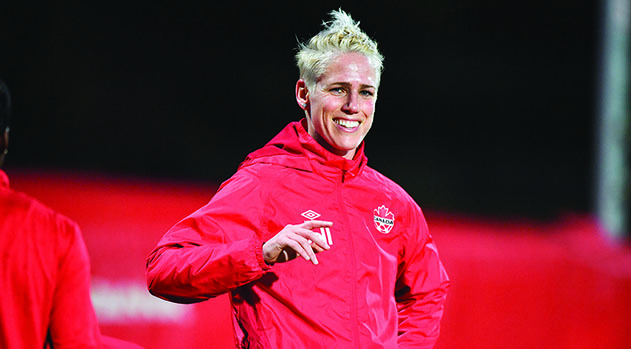 Sophie Schmidt at the Algarve Cup in Portugal in 2018. So she will visit the Student Union Building on the Abbotsford campus on to formally receive her honorary degree. And while she’s there, she will participate in a question-and-answer session with UFV president Joanne MacLean about her experiences as a professional soccer player, national team member, and two-time Olympic bronze medalist. She will also field questions from the audience. RSVPs would be appreciated at presidentsoffice@ufv.ca before Monday Feb 4. “This is a great opportunity for young athletes and Sophie’s Abbotsford fans to hear directly from her what it’s like to dedicate yourself to a sport, win Olympic medals, and compete on the world stage,” says UFV president Joanne MacLean. 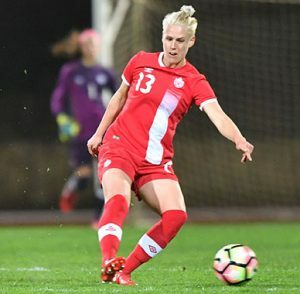 Schmidt was recently interviewed by CBC Sports about her assessment of the Canadian women’s national team’s chances at the World Cup this coming June. Speaking of family and friends, they are her great motivators. Her competitive spirit also drives her.